A French proverb says "wait until it is night before saying that it has been a fine day." This is never more true than at Mountain Creek. Ski or ride all day long and still find new places to explore at night as 100 percent of the mountain is open after dark. Discover why Mountain Creek is magic under the stars. Summer is no less exciting. Water World boasts 26 rides, slides and pools. Take a ride in the Cabriolet Gondola, the only 8-passenger open-air gondola in the country, which whisks you to the top of the 1,400' Vernon Peak. Or play a round of mini golf. In Mountain Creek, explore nearly 20,000 square feet of mini ramps, launch ramps, fun boxes and rails in the Gravity Park. Or drop into an amazing 8-foot vertical ramp. Learn some new tricks or perfect your technique during the day or under the lights. The Hightide Wavepool is one of the largest pools of its kind, sculpting over 450,000 gallons of water into perfect sets of waves every 10 minutes. In between bodysurfing sessions, sit back and relax on the Wavepool deck for the best in people watching. If the idea of combining the outdoor adrenaline adventures of a ski vacation at a fabulous resort in the Appalachians with exploring the urban excitement of New York City may sound like too much to ask for, then prepare yourself. With a vacation to Mountain Creek, New Jersey - it's all possible. Mountain Creek's proximity to NYC makes it the perfect starting place for day trips to the Big Apple. 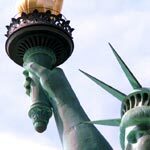 Before you leave, check out www.nyc.com for lists of attractions, museums, shops, galleries, neighborhoods and more. Metropolitan Museum of Art (212) 879-5500. Featuring 5,000 years of art With espresso, wine bars and fine dining you could spend a full day here quite easily. Cubist, Surrealist, Abstract, Dada and more - this is the place to get your fix of Dali and others. See the works of Gaigin, Degas, Cezzanne, Picasso, van Gogh and others. They are even more impressive up close. New York City is known for its arts, theater and culture. It's also home to some of the most interesting bookstores found anywhere. in Manhattan, features hard to find Magazines, books on architecture, design and typography. publishes dictionaries in over 100 languages. specializing in mystery, rare and out of print books. Visit www.nyc.com for everything you want to know about New York City. Take the Lincoln Tunnel to Route 3 West to Route 46 West to Route 23 North or take the GW Bridge to Route 80 West to Route 23 North. Follow Route 23 North to Route 515 North to Route 94 South to Mountain Creek™. Take the Garden State Parkway North to Exit 153 to Route 3 West, to Route 46 West, to Route 23 North, to Route 515 North, to Route 94 South to Mountain Creek™. Take Route 95 North to Route 31 North, to Route 202 North, to Route 287 North, to Route 23 North, to Route 515 North, to Route 94 South to Mountain Creek or take the New Jersey Turnpike North to Exit 10 for Route 287 North. Take 287 North to Route 23 North, to Route 515 North, to Route 94 South to Mountain Creek.